This is part 1 in a series on fishing rigs. The Texas Rig works best when you have many pockets on the bottom with few rocks. Learn all the parts of the Texas Rig, learn how to tie it, bait it, and how to fish with it. The sinker goes on the fishing line first, usually with the larger end facing the hook and bait. Next, Tie on the hook directly to the line with a strong knot. 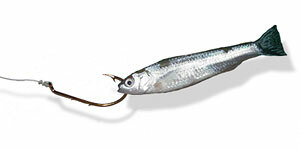 Now that you are ready for your bait, you can use a night crawler, plastic worm, or minnow. The Texas Rig was originally designed for a plastic worm, but you can use live bait as well. If you use a minnow hook it just behind both lips. This keeps the minnow alive, and allows it to swim freely. When using a plastic worm or night crawler, hook it through the thick part of the head about an inch down. Move the plastic worm or night crawler head all the way to the eye of the hook. Finally, hook the worm again just a little higher up the body where the barb of the hook rests against its body. Do not puncture all the way through the worm, rather hook into the body and allow the barb to rest inside the worm with the barb pointing upward. This will allow the bait to work weedless and minimize snags. When tying your tackle to your line you can try the Clinch Knot. I still think this is the best fishing knot for tying tackle. The Texas Rig is very versatile since you can use it almost anywhere. It has excellent casting accuracy since it does not use a leader. If you are fishing around dams or levees you will want to use a light weight to keep it from snagging between rocks. You can also use the Texas Rig through brush since the rig is weedless. The best place to fish however, is on the bottom where you have many pockets with few rocks. It works in variable depths but much better in clearer water so you can guide the bait into the pockets. The general idea to fish the Texas Rig is to bump and reel. Allow the weight to sink and tap the bottom then slightly give the line a tug upward. Reel in the slack and allow the rig to sink and hit the bottom again. This gives the bait a fluid movement and the weight hitting the bottom makes a bit of noise.